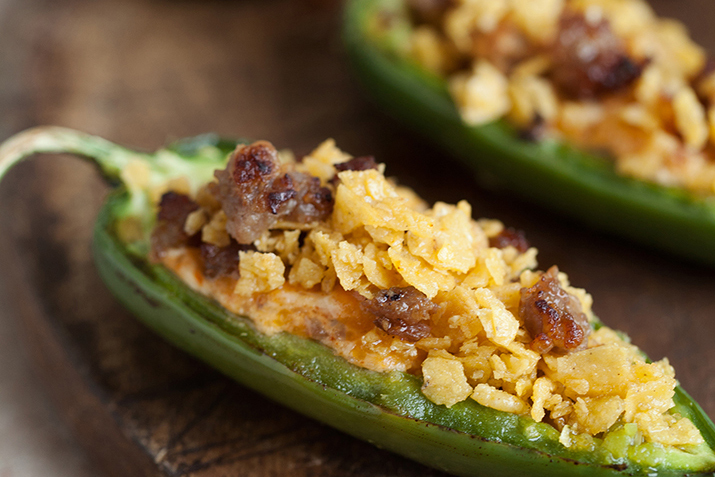 Spicy food fans will find plenty to cheer about with these jalapeños stuffed with spiced pork and smoked cheddar. Preheat oven to 375°F. Remove stems and slice each pepper in half lengthwise. Use a spoon to scoop out any seeds and some of the rib to make a boat. Place sausage in a skillet over medium heat and cook until evenly brown. Remove to a paper towel and allow grease to drain. In a bowl, mix the sausage, cream cheese, shredded cheese and seasoning. Press about 1 tablespoon of the sausage mixture into each jalapeño half. The sausage mixture should be just enough to mound above the pepper. Combine the melted butter and crushed tortilla chips in a small bowl or plate. Gently press each pepper, cheese side down, into the chip mixture and arrange the stuffed pepper halves in baking dishes. Bake for 20 minutes, remove from the oven and let sit for a few minutes before serving. Perfect for the spicy food fan, these stuffed peppers are a nice addition to classic Game Day fare like sandwiches, burgers, tacos, beer and chips with guacamole. Substitute your favorite cheese or sausage as desired, or use mini sweet peppers in place of the jalapeños.